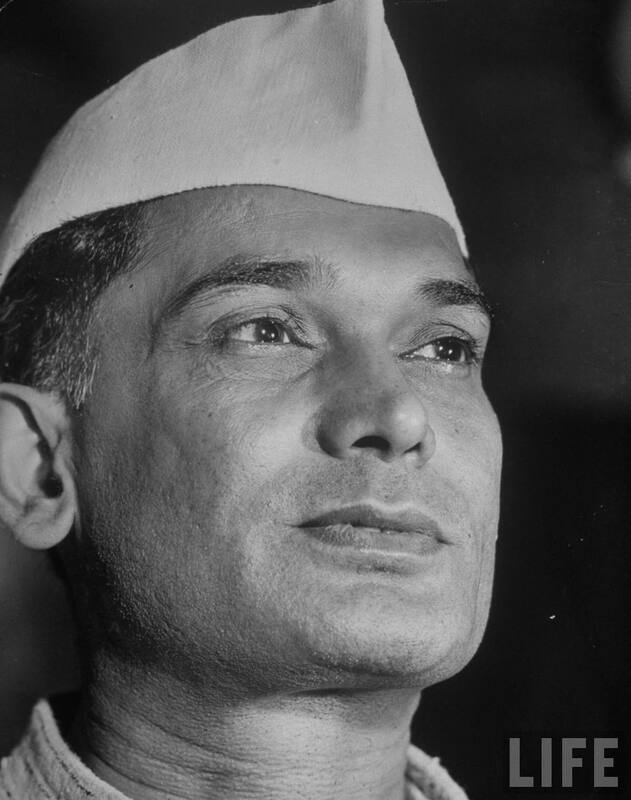 A disciple of Mohandas Gandhi and leader of India’s independence movement, Jayaprakash Narayan remained a rebel in his native land until the end of his life. Jayaprakash Narayan was a freedom fighter and political leader of India popularly called JP. Narayan played a pivotal role in the Quit India movement and is remembered for spearheading the opposition to Indira Gandhi during the 1970s era. In fact, he was the first to challenge the Nehru/Gandhi dynasty before Narendra Modi in real terms. Jayaprakash Narayan was born of middle-caste Hindu parents in a small village Sitabdiara, in the Saran district of Bihar on October 11, 1902. He was the fourth child of Harsu Dayal Srivastava and Phul Rani Devi. JP was a very bright student. While in school, though JP was not religious, he began to read regularly one of the most basic Hindu scriptures, Bhagavad Gita, deriving heroic inspiration from the great battle of the Mahabharata described in the book and from his overriding religious concept is essay, “the present state of Hindi in Bihar” won a best essay award. He became politically active in high school. In October 1920, Narayan was married to Braj Kishore Prasad’s daughter Prabhavati Devi a freedom fighter in her own right. Since Narayan was working in Patna and it was difficult for his wife to stay with him, on the invitation of Gandhi, Prabhavati became an inmate at the Ashram of Gandhi at Ahmedabad and became a disciple of Kasturba Gandhi. Jayaprakash, along with some friends, went to listen to Maulana Abul Kalam Azad speak about the non-co-operation movement launched by Gandhi. Maulana was a brilliant orator and his call to give up English education swept away Jayaprakash. JP took the Maulana’s words to heart and left Patna College with just 20 days remaining for his examinations. He joined the Bihar Vidyapeeth, a college run by the Congress. Just before his graduation, he followed the call of Indian nationalists to quit British-assisted institutions. In 1922, he went to the United States, where he studied political science and economics at the universities of California, Lowa, Wisconsin and Ohio State. After Vidyapeeth, JP decided to continue studies in the United States. At the age of 20, JP sailed aboard while Prabhavati remained at Sabarmati since he could not afford her abroad. Jayaprakash reached California on 8th October 1922 and was admitted to Berkeley in January 1923. He had his education in the US for seven years from 1922-1929. To pay for his education, Jayaprakash took several lower class jobs. All these jobs gave Jayaprakash an insight into the difficulties of the working class. Jayaprakash was forced to transfer to Lowa State when fees at Berkeley were doubled. He was forced to transfer to many universities thereafter. He pursued his favorite subject, sociology and received much help from Professor Edward Ross, the father of Sociology. In Wisconsin, Jayaprakash was introduced to Karl Marx’s ‘Das Kapital’. News of the success of the Russian revolution of 1917 made Jayaprakash conclude that Marxism was the way to alleviate the suffering masses. His paper on sociology, “Social Variation”, was declared as the best of the year. He remained attentively alive to the writings of sociologists throughout the world. His studies proved so engrossing that he did not write to his family members or friends for a year and they became exceedingly worried about him. However, he did write to Prabhavati, telling her that he had received an invitation to study in the Soviet-union, making again a personal request to accompany him on his visit to a Moscow. Prabhavati again refused to go with him. JP was dissuaded by his father Braj Kishore from India for going to Moscow and becoming a Bolshevik. Finally, he returned to India convinced that the central problem of human society was inequality of wealth, property, rank, culture, opportunities and the passage of time never obscured it. His wife Prabhavati was living with Kasturba Gandhi and had taken the vow of celibacy. JP respected his wife’s decision. During this period the Nationalist Movement had reached its peak of frenzy. Though JP was practically a committed Marxist, he was convinced that the communists in India must join the mainstream of the struggle for National Liberation. JP, who had read Lenin’s famous “Colonial Thesis” calling upon the communists in the “Slave” countries to take an active part in the national freedom struggle, was not convinced of Clemenus Dutt’s argument (whom he met in London way back to India). Later when JP joined the nationalist freedom movement, he was surprised to find that Indian communists were following the line which Clemenus Dutt advocated. JP could not understand the rationality of the fight against the INC (Indian National Congress) which was fighting for the freedom of the country. Due to the opposition from the communists in India who were supported by the Communist International, it became clear that JP could not carry out socialist movement under the Communist Party. He believed that it was the communists in India who were wrong and not Marx. The second disobedience movement of 1932 saw Gandhi, Nehru and other important leaders being put behind the bars. JP became the active General Secretary of the Congress. He organized the underground office and directed the struggle in various parts of the country. Eventually, JP was also arrested in Madras in September 1932 and was sent to Nasik Central Jail and was reported as “Congress brain arrested.” In Nasik central jail he luckily met a number of young leaders, Ram Manohar Lohia, Minoo Masani, Achyut Patwardhan, N.C. Goray, Ashok Mehta, M.H. Dantwala etc. The result of the fervent discussions between them was the emergence of The Congress Socialist Party (CSP). The Congress Socialist Party (CSP) was founded in 1934 as a socialist caucus within the Indian National Congress. Its members rejected what they saw as the anti-rational mysticism of M K Gandhi as well as the sectarian attitude of the Communist Party of India towards the Congress Party. This party decided to work both within and outside the INC. As JP was both a socialist and a nationalist, he tried his best to win over the communists and the Congressmen for creating a broad Socialist front to fight imperialism. Acharya Narendra Dev was made the president and JP the General Secretary. Post independence and death of Gandhiji, Jayaprakash Narayan, Acharya Narendra Dev and Basawon Singh directed the CSP out of Congress to create the first opposition, Socialist Party. This unit, later on, took the title Praja Socialist Party. Basawon Singh became the first leader of the Opposition in the state and assembly of Bihar, whereas Acharya Narendra Deva became the first leader of opposition in the state and assembly of U.P. In December 1939 as general secretary of the CSP, JP called upon the people to take advantage of the war to stop British exploitation of India and to overthrow the British Govt, to stop payment of rent & revenue and to establish their own government. JP was arrested and imprisoned for nine months. After his release, JP met both Gandhi and Subhash Chandra Bose to bring about a rapprochement between the two. His efforts did not bear fruit. He was soon arrested on charges that he had been plotting to bring about an armed insurrection in India and kept in Jail. In August 1942, Quit India war was launched by Gandhi. JP was still in Hazaribagh Central Jail. He was too restless to remain inside that he escaped from the prison with five comrades by scaling down the prison walls. Throughout the colonial period, JP often advocated the use of arms in the struggle for freedom, contrary to the stand of Gandhi. Then JP left for Nepal and organized and trained an “Azad Dasta“ (Freedom Brigade) there to paralyze the machinery of the British Government. Finally, he was again arrested in a running train in Punjab in September 1943 and in December, he was declared a state prisoner and was subjected to inhuman tortures to get the necessary information. In January 1945, after 16 months, he was transferred to Agra Jail due to the great anger of the Indian people. On release of both JP and Dr. Lohia in April 1946, the two men were given a heroic welcome by the people. JP was recognized as ”The Heart of India” and also “The King of the Hearts of the youth”. The politics at that time was marked by strife and petty jealousies among congressmen. Gandhi was again determined to launch a mass movement for the independence of India even without the support of the Congress leaders. JP at this juncture was certainly inclined towards Gandhi. JP also believed that the Congress had taken a wrong line in adopting the constitutional method and ultimately agreeing to the Partition of the country. Hence, the partition came as a rude shock to the socialists, including JP. “At the root of the all-pervasive problem of the crisis of character is the decline of religion. I wish to voice my serious concern over the state of Hinduism as it is found in practice. For the educated class and more so for the young, it has no meaning, except for certain ceremonies which are performed without faith to conform to social customs. For the mass of Hindus, religion means nothing more than a few mythological tales, crass superstition, some taboos and empty observances. Between word and deed, there are contradictions that balk the imagination. It is not uncommon to meet the catholicity of Vedantism in words accompanied with the most narrow-minded caste observances in deeds. There is a good deal of current talk about Hindu revivalism. I believe firmly that for Hindu society, revival is essential if it is to put forth its best and reach its height of achievement. What happens to the future of Hindu society depends upon which of these strains are to be selected, nourished and propagated” said JP. JP spoke severely against the caste system, which ironically became the only political tool for his modern-day political followers, be it Mulayam Singh Yadav, Laloo Prasad Yadav or Nitish Kumar who all started their political career as student leaders during JP movement. JP completely withdrew from party and power politics and con­centrated more on social regeneration through peaceful means. From 1950 to 1974, he remained with Acharya Vinoba Bhave and took interest an active part in ‘Bhoodan Movement’ and ‘Sarvodya’. He also went to Chambal Valley and persuaded the dacoits to surrender. Narayan returned to prominence in State politics in the late 1960s. This did not mean that JP kept quiet while there was social and political degeneration taking root in political freedom. Initially, he tried to organize people and make them conscious or aware of the situations and then appealed to the leaders. But with no response, he began to organize youth to save the democracy from degeneration and called this revolution as Total Revolution. Jayaprakash Narayan’s Concept of Total Revolution! Jaya Prakash once stated that Total Revolution is a combination of seven revolu­tions, viz., political, social, economic, cultural, ideological or intellectual, educational and spiritual; and the main motive being to bring in a change in the existing society that is in tune with the ideals of the Sarvodaya. JP had a very idealistic notion of soci­ety and it is in this endeavor, he shifted from Marxism to Socialism and later towards Antodaya. One of the main reasons for lack of development in India, according to JP, was the widespread corruption in all walks of life. He believed that the multiparty system and general elections every five years had reared corruption. Through this revolution, JP aimed at changing the society and also the individuals’ outlook. He laid out a plan for the movement on how the revolution should move on the propaganda for public education and constructive programs consisting of creating consciousness about various social evils such as dowry system, caste conflicts, communalism, and untouchability. Thus, JP had a very clear perspective of the social ideals and objectives when he took upon the task of guiding the Indian masses for a concrete action. The momentum to the movement came when there were agitations in Gujarat and followed in Bihar as well. 1974 ushered in a year of high inflation, unemployment and lack of supplies and essential commodities. Nav Nirman Andolan of Gujarat asked Jayaprakash to lead a peaceful agitation. On 8th April 1974, aged 72, he led a silent procession at Patna. The procession was lathi charged. In 1974, he led the students’ movement in the state of Bihar which gradually developed into a popular people’s movement known as the Bihar Movement. It was during this movement that JP gave a call for peaceful Total Revolution. 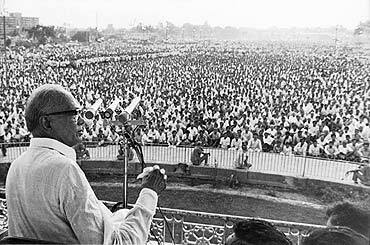 On 5th June 1974, Jayaprakash addressed a large crowd at Gandhi Maidan in Patna. He declared, “This is a revolution, friends! We are not here merely to see the Vidhan Sabha dissolved. That is only one milestone on our journey. But we have a long way to go. After 27 years of freedom, people of this country are wracked by hunger, rising prices, corruption, oppressed by every kind of injustice. It is a Total Revolution we want, nothing less!” JP attracted a massive gathering of people at the Ramlila ground and thunderously recited Rashtrakavi Ramdhari Singh ‘Dinkar’’s evocative poetry “सिंहासन खाली करो की जनता आती है” (Singhasan Khali Karo ki Janta Aati Hai). Indira Gandhi was found guilty of violating electoral laws by the Allahabad High Court. JP called for Indira and the PMs to resign and the military and police to disregard unconstitutional and immoral orders. He advocated a program of social transformation which he termed Sampoorna Kranti, “total revolution”. Immediately afterward, Indira proclaimed a national Emergency on the midnight of 25 June 1975. Narayan, opposition leaders, and dissenting members of her own party were arrested on that ‘Black Day’. Narayan was kept in jail at Chandigarh even after he asked for one month parole to mobilise relief in flooded parts of Bihar. In UK, Surur Hoda launched the “Free JP” campaign chaired by Nobel Peace Prize winner Noel Baker. His health suddenly deteriorated and he was released on 12 November. Diagnosis at Jaslok Hospital, Bombay revealed kidney failure; he would be on dialysis for the rest of his life. Indira Gandhi revoked the emergency on 18 January 1977 and announced elections. The Janata Party, a vehicle for the broad spectrum of the opposition to Indira Gandhi, was formed under JP’s guidance. The Janata Party was voted into power and became the first non-Congress party to form a government at the Centre. On the call of Narayan, many youngsters joined the JP movement. When Janata Party came to power, JP was hopeful that there would be a change in socio-political and economic situation in India. But unfortu­nately, the party leaders pursued their political ambitions and were attracted towards the corrupting influence of power, despite their pledge that they would aim at bringing about a just society. Naturally, the country slipped into old order of political rivalry and infighting. In March 1979, while he was in the hospital, his death had been erroneously announced by the Indian prime minister, causing a brief wave of national mourning, including the suspension of parliament and regular radio broadcasting, and the closure of schools and shops. When he was told about the gaffe a few weeks later, he smiled. Towards the end of his life, JP revealed his thoughts about India and the ideals for which he struggled all these years. He explained saying, “India of my dreams is a community in which every individual, every resource is dedi­cated to the service of the weak community, dedicated to ‘Antyodaya’ to the well-being of the poorest and the weakest”. Narayan died in Patna, Bihar on 8 October 1979, three days before his 77th birthday, due to effects of diabetes and heart ailments. Nobel Laureate Mother Teresa – Debunking the myth ! !